Order Woodman’s Fried Clams Online, Shipped Right to Your Door! Now you can fry ’em up like Chubby did! Every year, seafood lovers come to Woodman’s to taste these delicious New England delicacies. 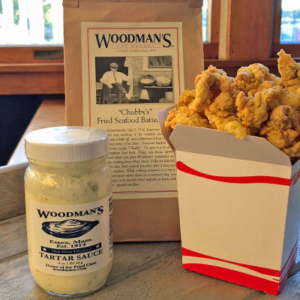 Now you can have Woodman’s fried clams shipped right to your door, and enjoy the #1 gluten free fried clams in the world, right in your dining room. The best fried clams for sale online in a kit? You bet! Our traditional gluten-free fried seafood batter is packaged with shucked steamer clams and just about everything else you need to make a Woodman’s fried clam feast; except for a kitchen full of friends and family. Order fried clams for sale online – shipped from our shore to your door! Guaranteed Live and Fresh via Two-day Shipping by FedEx, and guaranteed delivery by PeriShip (within Continental US). ORDER NOW!